One of the most festive times of year is here, and party food is on the menu. In the spirit of celebration, we chat to a few formidable chefs and food bloggers — Ming-Cheau Lin, Khanya Mzongwana, Parusha Naidoo, and Cape Town-based duo Tamzyn La Gorce and Kaeli Justus — about their festive food traditions. Parusha Naidoo is a vegan chef based in Joburg, who is known for sharing ideas about food through teaching cooking classes, creating pop-up food events, making food-themed art and chatting to anyone who enjoys talking about food. Through her creative projects, Parusha aspires to break the misperception that vegan food is unsatisfying. 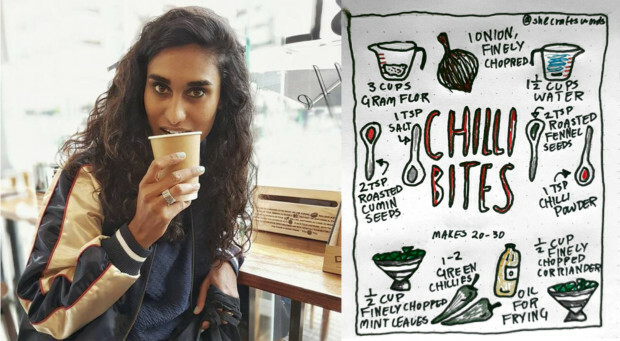 See Parusha’s chili bites recipe. What is your favourite festive dish and why? It’s difficult to pick just one favourite festive dish. My family celebrates Christmas even though we aren’t Christian. Usually the menu is a hybrid of British and Indian influences, including dishes like roast chicken, samosas, trifle, briyani and macaroni and cheese. The choice of sharing the chilli bites recipe is because they are a favourite from my childhood and universally delicious. The ingredients are more than just “inspired by”, they are a part of South African and Indian cuisine. I love the taste and smell of fresh coriander, mint and roasted spices. Varsity friends and fellow graphic designers Tamzyn La Gorce and Kaeli Justus document their vegetarian cooking experiments on their blog Give a Fork, which they started as a means to explore more of their creative interests — photography and illustration — plus create delicious dishes that are sustainable sourced. Their site is a great source for the sweet-toothed, vegetarian or not. See Tamzyn’s Christmas Trifle recipe. See Kaeli’s Christmas Mince Pie recipe. Do you have a stand-out memory, which you associate with your dish? Tamzyn: Dessert is my favourite part of any festivity and Christmas is no different. I remember my gran, who was the matriarch and in charge of all Christmas food, always made sure I had my very own bowl of trifle — banana free. I guess it’s the little things that make you feel special and my love for food definitely started with my family. As my gran got older, my mom handled more of the cooking and dessert making, and she only changed one thing; she added chuckles instead of regular chocolate. Kaeli: It’s amazing how many of our memories are about our grandmothers. Mine isn’t a particular memory but a mash up of Christmases spent sitting on my grandparent’s floor eating first the pastry edges of the mince pie and then the rest; while my Nana fussed about how much I was messing and asking if I wanted another. Originally from Taiwan and now based in Cape Town, Ming-Cheau Lin is a freelance copywriter and food culture consultant. At the moment, she is writing a stories and recipe book, to be published next year. 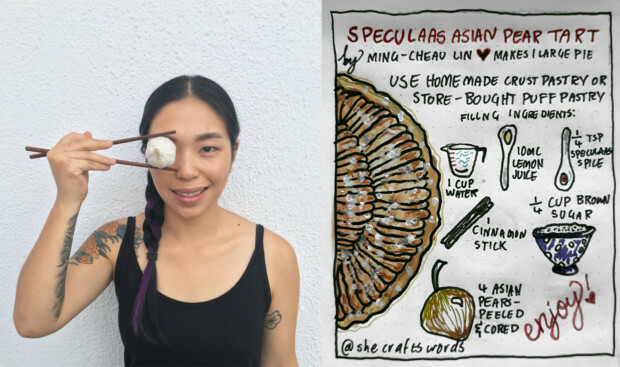 It will be based off of her popular food blog Butterfingers, where she posts Taiwanese home-cooking recipes using ingredients that are available in South Africa, and shares her food-related work around cultural appropriation versus appreciation. Check out Ming-Cheau’s speculaas Asian pear tart recipe. Since I was raised a Buddhist, we don’t have concrete traditions over December. But with the downtime, I do enjoy making food to share along with a spiced pie from scratch this time of the year for my husband and friends who aren’t celebrating either. My husband is Dutch and speculaas is one of his favourite nostalgic dessert spices, then with the addition of Asian pears I get to marry our cultures together in one festive dessert. I also try to be sustainable with my cooking, so it’s important to choose seasonal produce; in this case pears. 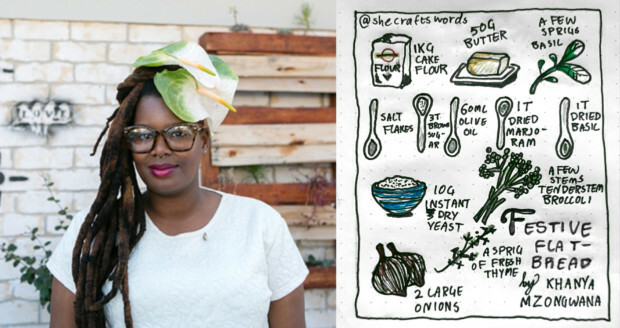 Khanya Mzongwana aka Yulu Ishii is a Joburg-based chef and food stylist known for her famous traveling food experience Off the Wall Pop-Up Restaurant and innovative recipes that have graced publications like Woolworths Taste and House & Leisure, and more. She is also the founder of Undignified, a social intervention that aims to make food accessible to all. Check out Khanya’s festive flat bread recipe. My xmas potluck offering is a massive, freshly baked flatbread the whole family can rip apart and dunk into gravy or slather with soft butter and wash down with big sips of wine. I’ve instilled homemade bread as something of a staple to every celebratory meal we have. My mom and I grow the broccoli, and the basil I put on the bread. I feel like any variation of roasted veggies piled onto this bread will be sure to turn out great — try roasted pumpkin wedges, squashed cherry tomatoes and fried pumpkin seeds or even braaied sweetcorn and honeyed bacon. You literally can’t lose, this is a gorgeous-looking side and extra points to you for taking the time to bake!